A French Jewish review, founded in 1840 by Samuel Cahen, author of a French translation of the Hebrew Bible. 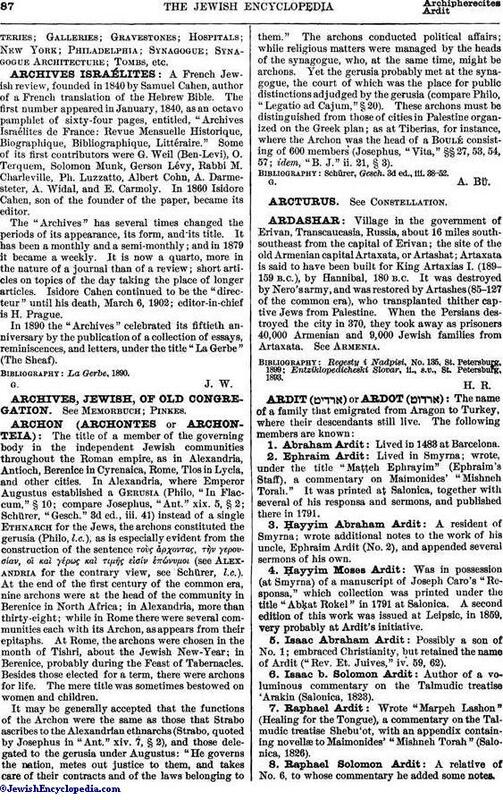 The first number appeared in January, 1840, as an octavo pamphlet of sixty-four pages, entitled, "Archives Israeacute;lites de France: Revue Mensuelle Historique, Biographique, Bibliographique, Littéraire." Some of its first contributors were G. Weil (Ben-Levi), O. Terquem, Solomon Munk, Gerson Lévy, Rabbi M. Charleville, Ph. Luzzatto, Albert Cohn, A. Darmesteter, A. Widal, and E. Carmoly. In 1860 Isidore Cahen, son of the founder of the paper, became its editor. The "Archives" has several times changed the periods of its appearance, its form, and its title. It has been a monthly and a semi-monthly; and in 1879 it became a weekly. It is now a quarto, more in the nature of a journal than of a review; short articles on topics of the day taking the place of longer articles. Isidore Cahen continued to be the "directeur" until his death, March 6, 1902; editor-in-chief is H. Prague. In 1890 the "Archives" celebrated its fiftieth anniversary by the publication of a collection of essays, reminiscences, and letters, under the title "La Gerbe" (The Sheaf).